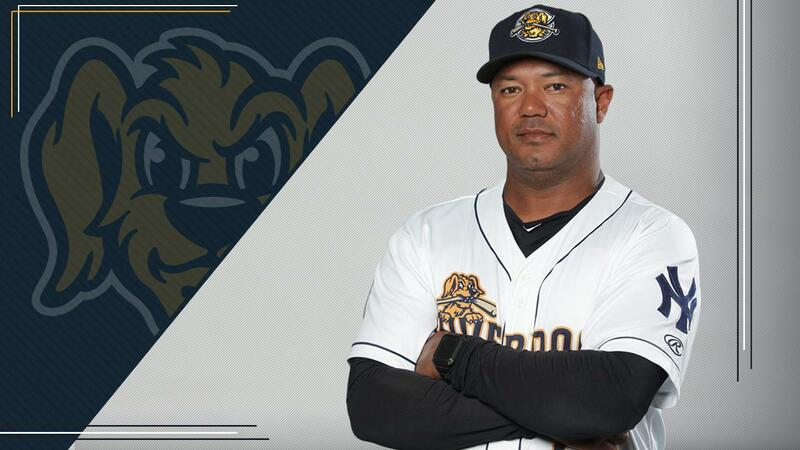 CHARLESTON, S.C. - The New York Yankees have announced that Julio Mosquera will return as manager of the Charleston RiverDogs for the 2019 season. "I was very excited when I got the appointment that I was going back to Charleston. It's a great place and a great baseball town," remarked Mosquera. "The fans and the front office make that ballpark an exciting place to be. I think with the coaching staff that we have now and the environment we're in, it's not only going to be hard work but a whole lot of fun too, especially when you show up to the ballpark and you know that fanbase and all the entertainment going on at the stadium are going to be there to back you up." Along with Mosquera, the Yankees also announced that former World Series Champion and Mt. Pleasant resident Greg Colbrunn will return as the RiverDogs' hitting coach in what will be his ninth season in the Lowcountry, split across three stints. Gabe Luckert was named as the first-year pitching coach for the RiverDogs while Francisco Leandro and Travis Chapman will serve as Charleston's defensive coaches on Mosquera's staff. Michael Sole (Athletic Trainer) and Danny Russo (Strength & Conditioning) both return as members of the Yankees' support staff in Charleston, while Matt Seletsky (Clubhouse Manager) and Nick Horning (Video Manager) both make their first stops in the South Atlantic League. Mosquera's second year in Charleston will mark the Panamanian's fourth as a manager in the minor leagues. The former Major League catcher previously held managerial gigs in the rookie ball Gulf Coast League from 2015-16 and served as a catching coordinator in the system for nine seasons prior (2006-2014), working with many of New York's top catching prospects, including Gary Sanchez, Austin Romine, and Francisco Cervelli. Another familiar face to Charleston fans, Colbrunn will reprise his role as the Dogs hitting coach after stepping aside as a roving hitting instructor with the Yankees organization the past two years. A veteran of 13 major league seasons as a player, the Mt. Pleasant resident spent eight of the last 12 years as part of the RiverDogs staff, interrupted only by a two-year stretch (2013-14) as the hitting coach for the Boston Red Sox, including their World Series championship year in 2013, and the past two years with his new role with the Yankees, where he made frequent stops at The Joe. The 47-year-old served five seasons as the RiverDogs hitting coach from 2007-09 and 2011-12, one campaign as the club's manager in 2010, and again as the hitting coach from 2015-16. As a player, the California native hit .289 with 98 home runs with seven different clubs, including capturing a World Series Championship with the Diamondbacks in 2001. Leandro, 38, enters the third year of his professional coaching career after serving as the hitting coach for the Pulaski Yankees in 2018. Originally drafted by the Tampa Bay Devil Rays in the 24th round in 2004, the Venezuelan outfielder spent part of his first professional season with the RiverDogs that same year, batting .340 (36-for-106) with a pair of home runs in 31 games in the SALLY League. Chapman, 40, joins Leandro as the infield specialist on the defensive staff after coaching in the same role with the RiverDogs during the 2015-16 seasons. Chapman enters his seventh season with the Yankees organization and spent 2018 on the Triple-A Scranton staff in the same role. He managed the Yankees' Dominican Summer League squad in 2017 after his pair of campaigns in Charleston.